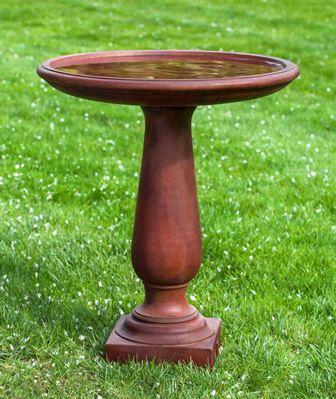 Birdsall & Co. carries the highest quality birdbaths available in cast stone, natural stone, and glazed ceramic. All cast stone products will age naturally with exposure to the elements. Efflorescence, the leaching of salts from the raw materials to the surface of the piece, may occur, resulting in a powdery white residue that will eventually wash away. This process will only occur once. Sitting water may also react with iron in the cast stone, resulting in a harmless powdery pink or orange residue. Cast stone birdbaths are concrete products made with a high level of limestone, making these handmade products dense and durable. 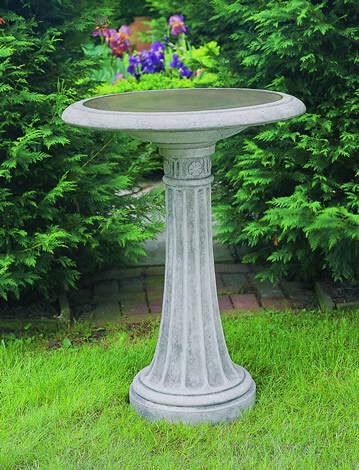 With all sizes and styles ranging from the modern to the traditional, our line of cast stone birdbaths offer garden decor to last for decades.